While sorting through old papers earlier today – or perhaps it was last week – the final play of a little known writer of considerable critical acclaim surfaced. If memory serves, it had been read while at high school, rather than watched, for reasons that will become apparent. If the recollection is accurate, the work of Morris Minor – there is no connection to the automobile of the same name – was encountered at about the same time as a children’s story involving farm animals. Minor’s works demanded, if not a passing interest in talkative animals, a willingness to push stubbornly through boredom, sometimes to get to terror. These were in the beginning of Minor’s career exceedingly long works either of prose or for the stage that neither yielded to comprehension nor went anywhere but if pursued to the very end produced in the reader or audience member a sense of personal accomplishment rarely on offer in the literary realm. They had become by the end of Minor’s career such short works that the most committed loyalists to his cause might have demanded their money back if the impact had not been so unsettling or shocking or in one instance fatal as to impart a certain social cachet on whoever experienced their full force. The sparing use of commas and liberal employment of the long sentence in his earliest works gave way, mid career, to a renewed interest, not only in the comma, but in other, disparate grammatical constructions. His sentences, too, got shorter. By career’s end, he refused point blank to use complete sentences at all, a decision exemplified by his commercially unsuccessful though greatly admired in certain circles ‘Novel Shorter Than A Short Short Story’. What emerged, initially, as merely an unusual literary choice – albeit a rather aggravating one for readers yet to be weaned off established rules of grammar – grew in the eyes of less sympathetic critics into an ideology as boorish and strident in its expression as that of any zealot’s. If the length of his paragraphs had not shrunk at a comparable rate to his sentences, the overall effect might have become unbearable even for his more committed followers. Mostly, however, his followers stuck it out until the bitter end. And the end was in fact bitter, the full power of Minor’s work ultimately wreaking havoc on a high proportion of his audience. Indeed, it is an intriguing side note of history – a sad one, though no less interesting or intellectually gratifying for that – that the more committed his fans, the more likely his writing would be the direct cause of their premature deaths. The community outrage was as predictable as it was tiresome, middle-class morality once again inhibiting the artistic freedom of a writer willing to go wherever his instincts drove him in the delivery of pure, untainted literary expression. Life imprisonment for “mass murder by the avant-garde” was ultimately the price Morris Minor paid for his unfailing literary courage and refusal to compromise. But we are getting ahead of ourselves. Sunset. Scrabble. Port. Spider. Funeral. Sunset. The vitriol with which Minor attacked readers daring to interpret “Scrabble” as a verb rather than a noun, or the “set” in “Sunset” as playing the role of a verb, put paid to any doubts over the “doing word’s” status in Minor’s literary world. Apart from the absence of verbs, the most striking aspect of this work initially appeared to be its clear meaning. In truth, the clarity is more apparent than real. Is “Port” a beverage or location? Is the “Spider” the story’s main character or villain? If not the main character, who is the main character? Is she, he or they singular or collective? Nowhere in the six chapters of the novel, each a word shorter than the previous, does a protagonist make an explicit appearance. Much to Minor’s chagrin, most readers blithely clung to their initial naive reading, believing they had understood the novel’s meaning without any difficulty at all. The disillusionment caused by this experience perhaps explains Minor’s decision, in his final work, to refocus his energies on the stage, with a determination to create a play that would challenge his audience’s very perception of itself and leave it unsure whether it had ever actually understood even a single word of anything he had produced throughout his career. So greatly did he labor over its central themes that its form continued to evolve through the final decade of his life as a free man. Simply entitled ‘Fire’, the play required no actors. There were initial reports in the entertainment section of the Newspaper that this was due to Minor’s acrimonious relationship with the acting fraternity. These reports, however, were almost certainly false. Numerous actors came forward to state that Minor had always been a joy to work with and that relations remained congenial. Few, if any, critics ever put much stock in the reports. They knew, based on a close reading or observation of Minor’s work, that his antipathy had always been reserved solely for his audience. It was an antipathy that started out strong and only grew from there. His audience, for its part, seemed to be inspired by Minor’s utter refusal to give an artistic inch, whether it be in the direction of developing what might in any sense be recognized as a storyline to permitting a glimpse, however momentary, into a character’s thoughts or inner motivations. Meaning, in his work, was invariably impenetrable, precisely as intended. The literary effect, in the estimation of audiences and critics alike, was tedious to the point of mesmerizing. It is a noteworthy aspect of the symbiosis between Minor and his admirers that the higher the esteem in which they held him, the more he grew to loathe them and the more devastatingly he deployed the theatrical weapons at his disposal. The changing nature of his theatrical masterpiece, ‘Fire’, provides as good an example as any of the phases through which Minor’s disdain and eventual hatred of his audience developed through time. In the play’s earliest performances, there is nothing but an empty stage, a fire hydrant and an emergency exit. The audience sits in darkness. The stage itself is in darkness. The only things visible are the neon green exit sign above a door behind stage and a dim light above the hydrant. After a delay – varying, usually, from between five and fifteen seconds – somebody backstage, allegedly Minor himself, lights a match and sets the building ablaze with the aid of kerosene. The effect on audience members is astounding. Indeed, the brilliance of the piece in the view of many critics – as with any great work of art or literature – is in the way each member of the audience experiences the situation in his or her own unique and authentic way and, yet, at the same time experiences an effect that is universal – that of universal panic. The play, even in its earliest form, was vintage Minor. From his first literary offerings, whether of prose or theater, Minor always demanded that his reader or audience do most of the work. If the audience failed to understand, it was not trying hard enough. If it did understand, Minor himself had not compelled his audience to try harder. Or, at least, this was the unforgiving regimen to which Minor continually subjected and re-subjected himself and his audience. If it were up to Minor, his every artistic effort would have been denounced a failure. Fortunately, even his harshest critics were less severe than the artist himself, and his genius, for most of them, was in the end unquestioned. Minor’s antipathy toward his audience reached its penultimate stage in the middle years of ‘Fire’s’ theatrical run. The change on stage was simple but effective: the fire hydrant was removed. In the play’s final season, the emergency exit was blocked. This entry was posted in Humor by peterc. Bookmark the permalink. If reserves don’t buy assets for banks then what does? The answer is simple. The bank takes the asset and *creates a matching deposit*. Just as it does when it creates a loan asset. It’s good old balance sheet expansion again aka MONEY CREATION. That’s why banks are desperate to be ‘universal’ banks (combined commercial and investment banks). It saves the investment part all that messing around with external overdrafts and oversight. 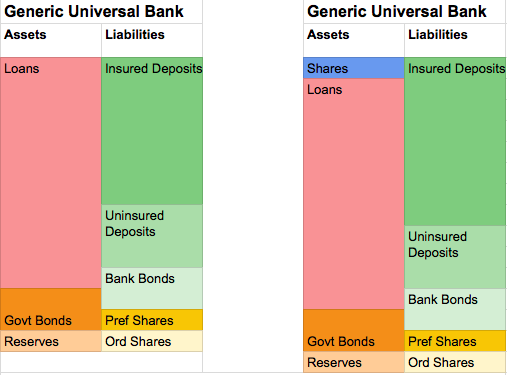 When universal banks talk about matching deposits to risk assets, this is what they mean. * A margin account called “mortgage” is available nearly to anybody, with leverage ratios of 4x or even 20x with “Help to Buy”, and is sold by several shops in most high streets. This can turn a yearly rental yield on the property of 5% into a yearly gross return on capital invested of 20% or even 100%. More as the house appreciates and the rent goes up. * Not only the 4x or 20x leverage can boost *rental* ROI by as much, but for the main dwelling there are no capital gains taxes at all, and capital gains of 5-10% per year can double or quadruple the gross rental yield of 5%, and rather more than that after tax and expenses. * The margin account called “mortgage” has no margin calls on the borrower after she pays the initial deposit. * Offering a margin debt is quite safe for the lender too, even without margin calls on the borrower, because if the collateral goes down in valuation the *government* will provide extra margin to the lender in the form of extremely generous bailouts; plus the borrowers vote and the government will have a strong incentive to boost up again the collateral valuation, or change accounting rule to let lenders value the collateral to fantasy.